Matthew McConaughey is a famous American actor and filmmaker who is most widely known for his Academy Award-winning role of Ron Woodroof, a cowboy diagnosed with AIDS in the biographical film Dallas Buyers Club. He first became known for his role in the critically successful film Dazed and Confused. Being one of the leading actors in Hollywood, McConaughey has appeared in a number of hit movies like Amistad, Contact, The Wedding Planner, The Lincoln Lawyer The Sea of Trees, Free State of Jones, among others. His popularity further propelled with his role on HBO’s True Detective, for which he won the Critics’ Choice Television Award and TCA Award. Matthew McConaughey was born on November 4, 1969, in Uvalde, Texas, USA. He is currently 49 years old. He has Irish, as well as English, German, Scottish and Swedish ancestry. Matt attended Longview High School in Longview, Texas. He then enrolled at the University of Texas at Austin College Of Communication, from where he graduated with a Bachelor’s degree in Radio-Television-Film in 1993. McConaughey married his girlfriend and model Camila Alves in a private Catholic ceremony on June 9, 2012, in Austin, Texas, after dating for over six years. The couple, together, have three children: sons Levi Alves McConaughey (born July 7, 2008) and Livingston Alves McConaughey (born December 28, 2012), and daughter Vida Alves McConaughey (born January 3, 2010). Previously, he has dated many celebrities, including Ashley Judd, Sandra Bullock, Janet Jackson, and Penelope Cruz. Matthew McConaughey made his acting debut with the 1993 film My Boyfriend’s Back, in which he played a minor role. That same year, he earned his first prominent acting in Dazed and Confused, an coming-of-age comedy film, playing a role of David Wooderson. He received critical praise for his work in the film. In 1992, he guest starred in an episode of NBC’s Unsolved Mysteries as Larry Dickens. McConaughey played Steve Edison in The Wedding Planner, his first box-office success, which earned $94 million at the box office. His portrayal in the film Magic Mike was highly praised and the film was a critical success that won several awards in the category of Best Film. The film received the National Society of Film Critics Award and the Independent Spirit Award. He then starred in the film Dallas Buyers Club, which earned him an Academy Award for Best Actor and Golden Globe Award for Best Actor – Drama. He essayed the role of Ron Woodroof, a rodeo rider who was diagnosed with AIDS and struggles to get treatment for the same. His other notable works in film include his roles in How to Lose a Guy in 10 Days, Failure to Launch, Fool’s Gold, The Lincoln Lawyer, Killer Joe, Mud, Magic Mike, Dallas Buyers Club, The Wolf of Wall Street and Interstellar. McConaughey began his journey in show business by starring in television commercials. He has appeared in a number of TV commercials, including Stetson cologne, US Peace Corps, Dolce and Gabbana, and Lincoln MKC luxury utility. Matthew McConaughey has a net worth of $95 million. He owns a Spanish Mediterranean themed mansion situated in the Rivercrest area of the Lone Star state’s most cosmopolitan city near Lake Austin. The mansion was valued at $6 million, which boasts 7 bedrooms, 8 bathrooms, an elevator, two circular motor courts that can garage at least four cars and other luxury amenities. He also owns a 1,600-acre ranch in west Texas, which he purchased for $500,000. He had spent an year in Warnervale, New South Wales, Australia as a Rotary exchange student in 1988. 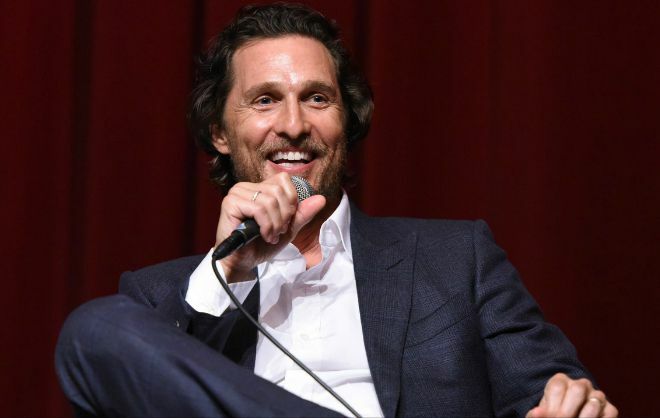 McConaughey was a part of the “Delta Tau Delta” fraternity during his college years. Mathew was voted “Most Handsome” in his senior year of high school. He is a huge fan of the Washington Redskins NFL team. Mathew was originally considered to play Jack Dawson in Titanic (1997), until the role went to Leonardo DiCaprio. In February 2005, Mathew served as the Grand Marshall for the Daytona 500 in Daytona Beach, Florida.. He was named as the Sexiest Man Alive in 2005 by People Magazine. Mathew is good friends with Lance Armstrong, Jake Gyllenhaal, and Reese Witherspoon. He was voted as one of People magazine’s “Hottest Bachelors” in 2006. He was inducted into the Texas Film Hall of Fame on March 10, 2006 in Austin, Texas. He received a Star on the Hollywood Walk of Fame at 6931 Hollywood Boulevard in Hollywood, California on November 17, 2014. To prepare himself for the role of Ron Woodruff, his Oscar award winning role in Dallas Buyers Club (2013), McConaughey had to lose around 47 pounds. In April 2014, Time magazine named McConaughey as one of the “Most Influential People in the World”.